by Zacks Equity Research: Technology giant and Dow component Cisco Systems, Inc. recently entered into a strategic alliance with a robotics company Fanuc America, thereby stepping up its efforts to make itself a key player in the Internet of Things (IoT) space. 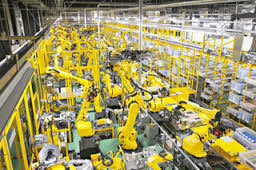 Per the alliance, Fanuc and Cisco have built an IoT system that enables Fanuc to monitor every robot on the factory floor. This way it can be determined whether a robot is likely to fail, so that a service technician can fix the equipment before it stops working. This could save companies hundreds of dollars of fixing cost. Per Cisco CEO Chuck Robbins, downtime for these robots can cost a business $16,000 per minute. Therefore, the new system that offers predictive maintenance can be a big thing for some operations.